Sid Shafner and Marcel Levy forged a close friendship after Shafner liberated Dachau concentration camp, but the two lost touch for decades. 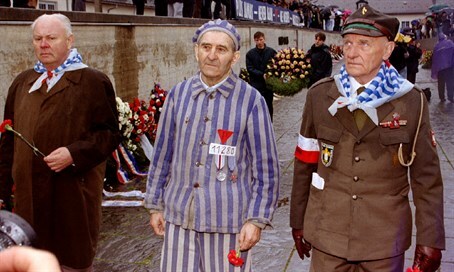 Sid Shafner was one of the first American soldiers to enter the Dachau Nazi concentration camp in Germany - liberating some 30,000 inmates - and the evidence of Nazi atrocities he saw there remained with him for the rest of his life. But amid all the horror, Shafner also forged a close friendship with 19-year-old Marcel Levy, a young Jewish camp inmate just four years younger than him. The two remained close even after the war, but later went more than 20 years without seeing each other. Then, last week Shafner was honored at a ceremony in Poland for his role as a liberator. Then, during a trip to Israel, an emotional reunion awaited. The 94-year-old veteran was reunited with Levy, now 90, thanks to the Friends of the Israel Defense Forces organization (FIDF), as part of its "From Holocaust to Independence" delegation to Poland and Israel. The two met on an Israeli Air Force base. FIDF President Peter Weintraub recounted to ABC News the remarkable history of the two men's deep friendship. "Sid tells the story that his convoy was stopped by a Jew named Marcel," he recounted. "Marcel tells him in Yiddish that 'You have to leave your route and divert to help us,' which he did." Despite losing touch for 20 years, Shafner and Levy reconnected immediately in an emotional moment captured on film. "Everything I have today, all of my children, grandchildren and great grandchildren, is due to you, Sid,” Levy told Shafner, Weintraub said, in comments the elderly survivor - who today lives in Israel - repeated in a CBSN interview. "Sid is crying tears of joy," he added. "We have done this trip several times but never have we reunited survivors and liberators."